The Greenway Parks pad was gloriously transformed with pieces from Ashley Longshore, Arteriors, and plenty of pretty wallpaper. 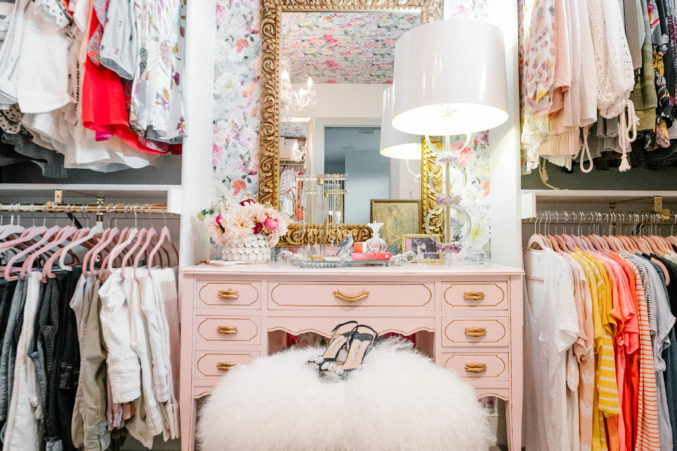 We can (un)officially confirm that heaven, indeed, is a place on earth – and it just might be inside Studio Ten 25 owner, Abbe Fenimore’s closet. That is, of course, if heaven to you looks like a glamorous floral dream. What’s not so dreamlike? The process it took to get there—at least at first. 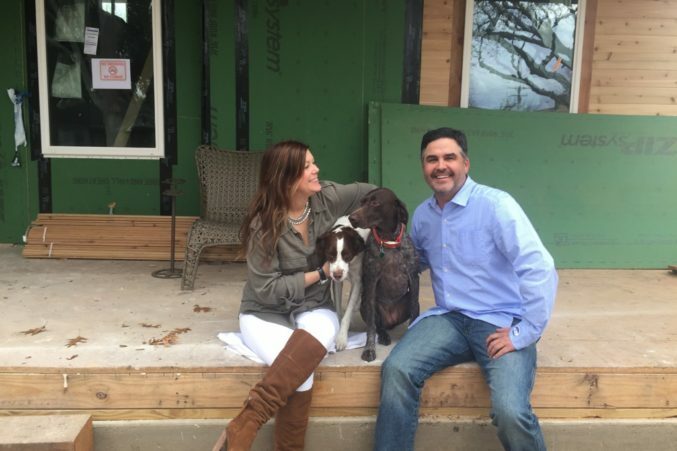 Two days before the Dallas designer and her husband Dru closed on a home near Midway Hollow (and days before they were set to move in), the contract fell through. So, three days after Christmas in 2016, the couple and their two sweet dogs found themselves scrolling on Priceline.com, renting out storage space for their life’s belongings and booking stays for their furry companions at Barking Hound Village. Most would have felt defeated, but ever the optimists, they didn’t let the ordeal get to them. “We kind of made an adventure out of it,” says Abbe. After six weeks of hotel surfing, the couple decided it was time to ditch the reservations and find a slightly more permanent situation. While out apartment shopping, the Fenimores cut through Greenway Parks and stumbled upon a brick bungalow with a “For Sale by Owner” sign beckoning them to take a look. Within minutes, they were sold on the 1949 abode. While something was “always happening” with the other home, everything fell into place with this one. They moved in to the detached two-car garage seven days later, and converted it into a livable space by adding HVAC, a full bath, closet, and a mini kitchen. Steps away from the home, and with an architect (Todd Hamilton), engineer, and contractor on board, Abbe set out on her most personal design project yet. Abbe and Dru Fenimore before the transformation began. 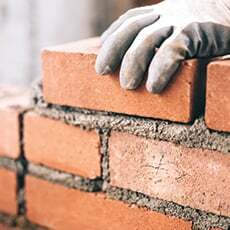 When it came to the renovation, decisions came naturally. So much so that the entire process lasted only six months. The couple knew they wanted to remain true to the character of the neighborhood, keeping the foundation and brick structure of the home intact. They knew they wanted comfortable spaces for guests to feel at home in, so they expanded the home’s footprint, nixed a formal dining area and created a large family room. However, when it came to the interiors, they struggled. “I see so many wonderful things in this industry, so I had to sit down and be really patient,” says Abbe. And then there was finding a balance between it all: both her interior design firm’s full roster of clientele and the duo’s “very different” aesthetics. Butte cone pendants in the kitchen are from Rejuvenation, the backsplash is Daltile Artigianao in Italian Alps, and the barstools are by Bernhardt. 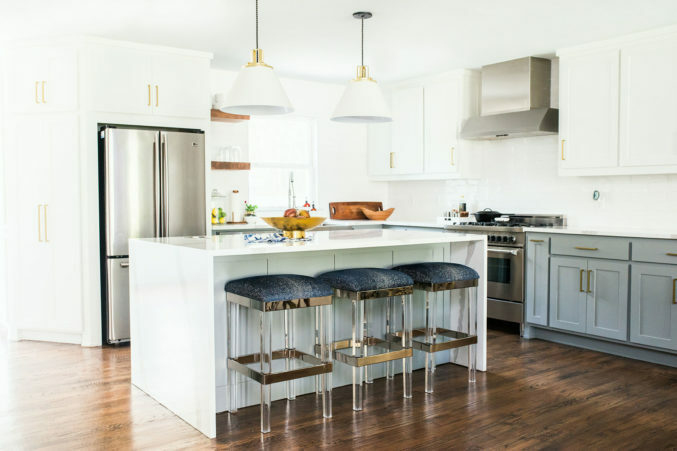 Nearly every inch of the light-filled bungalow seamlessly blends a little Abbe and a little Dru to craft a warm, modern-meets-bohemian vibe throughout. Gallery white walls allow Abbe’s colorful details to pop, including the watercolor cactus-printed fabric on the dining chairs, the geode-inspired Times Two Designs lamp in the master bedroom, and the living room’s blue-and-white Kravet lounge chairs. You might assume the European mounts in the dining room were Dru’s touch, but it was Abbe who thought to take the skulls to E&D Plastics and have them mounted on acrylic. This, along with the sleek mirrored buffet and Victorian-style paintings of their regal pups, Ivy Banks and Caddo Brown, create one of the designer’s favorite corners in the entire house. The vanity’s stool was purchased from a resale furniture shop and covered in Mongolian fur. However, the closet, with its leopard-print Stark carpet and bed-of-roses wallpaper from Designers Guild, is all Abbe. In fact, most of the pieces in the room come from family members she’s lost. The 1920s vanity (painted a pretty pastel) and gold mirror were brought in from her grandparents’ home. The chandelier hung in her great-grandparents’ dining room and the portrait atop the vanity was saved from her grandmother’s home by her father. These dainty details, coupled with the white Mongolian fur-covered vanity stool, come together for a delightfully feminine look. And while the designer makes compromise look easy, this was one vision she didn’t back away from.